Six years ago I remember sitting on my couch in my apartment in Texas with a bowl of cereal and my laptop right next to me. I had been watching Titanic, one of my favorite movies-don’t judge me. It was a Thursday and just like any Thursday I normally would’ve been in my cubicle at my 9 to 5 right next to my cube-mate who seemed to always wear that same brown sweater vest, dark blue dockers and black loafers every Thursday. You see, I took off work that day because I was “sick.” Sick and tired of seeing the same co-worker in the same outfit sitting next to me in the same cubicle working that same job and feeling trapped. I had a nicer apartment, I made 52K a year and as comfortable and as stable as my life had been at the time, I was miserable. That was about to change thanks to the Titanic and an iceberg. To make my tall tale a short one, in the movie, the first mate of the ship told the captain about an upcoming iceberg he feared they’d run into if they kept their current course. That night on April 14, 1912, it was so cold all of the navigation instruments froze and using simple math and a telescope to track the distance from the iceberg assured his first mate that they wouldn’t even come close to hitting the piece of ice floating in the ocean. Well, he was wrong. You see, he only calculated the distance from the iceberg that he could visually see above the surface and by the time they realized it, the large section of iceberg under the water had crashed into the lower hull, filling this cruise liner with water eventually causing it to stand straight up out of the water, snap in half and sink into pieces. The captain, as capable and intelligent as he was made the most common mistake when dealing with icebergs; what you see above the surface is only 20% of the iceberg’s mass. Icebergs are similar to buoys in shape; the ice under the water accounts for about 80% of the entire thing —the bit that you see poking out of the water is only 20% of it. Sitting next to my laptop, I realized my purpose and my next major life decision. I ditched the office life and moved to Los Angeles two years later to pursue entertainment. Everyone looks at the endorsements, commercials, the fame and fortune and all of the benefits that come with being famous and well-known. Let’s be honest, it’s one of the main benefits to being in the industry. These are the most sought out perks because we see these things all of the time; they are “above the surface” What people fail to realize is that all of those things that you see above the surface that you watch or aim to acquire is only 20% of the “iceberg” or the journey. There was about 80% of work that was done below the surface in order to have enough structure to make that 20% float and to see those accomplishments, just like an iceberg. That 80% includes never being recognized for the work to do, all of the hours you put your blood sweat and tears into working your craft, all the “No’s” that you hear along the way, the pressure and long nights in the dark trying to breathe air and life into your passion while feeling like underwater-much like sinking in the Atlantic. That’s when I developed 8020creative; services and guidance in career coaching, artistic instruction and motivational/self-help coaching for professionals in the making. 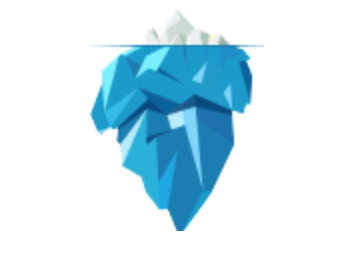 With 8020creative, I show you how to flip the iceberg upside down and focus on what really matters, the base of your iceberg and the hard work that it needs to make sure your successes stay afloat.